A military coup d'etat in Sudan has ended Omar al-Bashir's 30-year rule. This is the sixth coup the country's military have led since independence in 1956. The military were pressured into the coup by the country's third major civilian uprising. Historically, the two most famous uprisings were the October Revolution of 1964, which ushered out Sudan's first military regime, and the April Intifada of 1985, which ousted the second. As in the 1985 uprising, the military maintain that they are siding with a popular uprising. A Transitional Military Council has been formed and its leadership maintains that it's committed to bringing back a civil state and multi-party democracy. But there's still considerable scepticism towards the new military leaders. 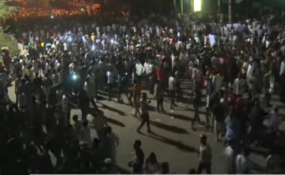 Protesters continue their sit in outside army headquarters, which originally began nine days ago when they demanded the army support the movement against al-Bashir. They now fear the army may use force to break it up. There is a real risk that a trend which emerged during the last two transitional periods of 1964 - 1965 and 1985 - 1986 will be repeated. On both occasions key rebel groups didn't participate in the negotiations. This meant that negotiated settlements of the country's broader conflicts were doomed from the get go. The other danger is the military's future role. Key here will be the relationship between the new military transition council and the civilian leaders of the Intifada. It's crucial that the professionals and other political forces do not allow the same issues that divided them in 1985 to divide them today. This could play into the hands of the factions in the military that want to maintain the authoritarian system which awarded the majority of the government's budget to the security sector. Events since al-Bashir was forced out suggest there's still a lot left to play for. Lieutenant General Ahmed Awad Ibn Auf was named as al-Bashir's replacement. But he was forced to step down after just one day as protesters regarded him as too close to al-Bashir's regime. General Abdel-Fattah Burhan then took over the military council, immediately promising to "uproot" al-Bashir's regime. He also promised to hand over power to civilians after a two year transition period. Burhan, a soldier by profession, has never previously taken any political positions. His role in the army included responsibility for Sudan's operations alongside the Saudi led coalition in Yemen. He also has close ties to the Transitional Military Council's new deputy leader Mohammad Hamdan aka Himeidti, who helped him remove al-Bashir from power. Himeidti is the commander of the Rapid Support Forces, a private military force which was partially integrated into the military and security services. The unit is regarded by many as a re-branded version of the Janjaweed militias of which Himeidti was himself a part. These perpetrated mass atrocities during the government's counter-insurgency against the rebel movement in Darfur from 2003. How the leaders of the Darfur rebel factions react to Himeidti's involvement will be crucial to the viability of any transitional government Burhan leads. The Transitional Military Council has demanded that it's represented in both the interior and defence ministries. It's also crucial that any new technocratic cabinet is not seen as being biased towards one political group or set of interests. Historically there has been a great deal of crossover between prominent professional unions and the political parties. Particularly with regards to lawyers, doctors and university lecturers who played a prominent role in the forerunner of today's Sudan Professional Association. During the uprising the Sudan Professional Association has been good at not making its affiliations clear. But as it becomes more public - and members engage in talks and join transitional bodies - there will inevitably be considerable speculation as to its sympathies. The new cabinet should also take two other issues on board: women's representation and regional representation. Regional representation is also key. There's a real risk that the trend from the last two transitional periods continues. Then, political forces based in the riverain north negotiated the transition to democracy and rebels did not participate in the interim governments. This meant that the war in the periphery continued, as did the regional inequalities that fed it. It's crucial that both east, west and the new south - and particularly the groups targeted by the regime's lethal counter-insurgencies - are given fair representation.